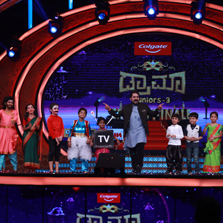 The popular reality show, Drama Juniors Season 3 has come to its last-leg, with the Grand Finale on another exhilarating season being telecasted on March 24 at 6:00 PM only on Zee Kannada and Zee Kannada HD. The Grand Finale was hosted in Tiptur, also known as Hasya Chakravarti Narasimharaju; significant as the place contributed to many talents in the field of films. It is birthplace of actress Umashree, who is well-known in the theatre and cinema industry. Tiptur is a place of education, and is popular for the Temple built by Raja Someshwara for Honnavalli's mother. The final stretch of the little stars, in comedy, dance and entertainment, was inaugurated with a puja in the evening at Tiptur in Tumakuru district, that continued late into the night. Huge crowd gathered in Kalpataru Taluk Stadium, Tiptur, as a testimony for all the supporters who wished to witness the acting talent of our Drama Juniors little stars. The esteemed panel of judges, Vijay Raghavendra, Julie Lakshmi and Mukhyamantri Chandru commenced the Grand Finale by wishing luck to all the well-deserving finalists who were gearing up to entertain all Kannadigas through their concluding performances for the Grand Finale of Drama Juniors Season 3. Special performances by the Kannada television's most-cherished artists, Kamali Rishi, Paru Adithya, Hiranmayi and Surya from Zee Kannada's Mahadevi, Kamali, and Paru, who danced and entertained the people of Tiptur. The audiences danced to the singing performances by the winners of Sa Re Ga Ma Pa Season 15, Keerthan Holla and Hanmanthu, and Master Anand made the crowd go wild with his dance performance. The entertainment quotient of the night was raised by the various group acts, Jugalbandhi and solo rounds. The performances were, Cinema V/S Serial, Jeeni, Daksha Yajna, Kalidasa Bhojaraja, Nakshatrika, Kisa Gotami, King Lear, and Sakavva of Odalala skits. The stage was built by the effort of many diligent labourers and technicians that attracted the thousands of audiences of Tiptur. The viewers showed-up two-three hours in advance, eager yet enthusiastically waited to witness the Grand Finale to cheer along to the performances of their favorite contestants. The Jury trio, along with the sponsor of Drama Juniors Season 3 Grand Finale, C J Roy, Founder, Confident Group, ended the curiosity by announcing the title winner of the season! Tune-in to watch which one of you favorite Drama Junior took home the title in Season 3, on March 24 at 6:00 PM only on Zee Kannada and Zee Kannada HD.